Saturday 28th July the Mid North Coast friendship Zone Day was held at Nambucca. One of the keynote speakers was Libby Ussher, ABC Radio presenter, Horticulturists, Garden Consultant and passionate gardener. Alyssum, Bacopa, Bedding Begonias, Brachyscombe, Calibrachoas, Daisies, Dichondra, Fuchsias, Geraniums, Impatiens, Ivy, Lobvelia, New Guinea Impatiens, Scaevola, Snapdragon (Dwarf), Tuberous Begonias. The practice of hanging flower baskets was introduced in 1937 to commemorate the 75th anniversary of Victoria's incorporation. The baskets are displayed on downtown lamp posts every June, signaling the start of summer where they remain until September. Nine different varieties of plants are used to make a sun basket, with a total of 25 plants included in each basket! The plants for the baskets are grown at the City's nursery and in late April a crew of six gardeners begin constructing approximately 1,300 hanging baskets. This takes place over a four week period. After the baskets are made, they are conditioned first for one week in a greenhouse and then they are moved outside to acclimatise. Once the hanging baskets are placed they are watered every night throughout the summer, hand held wands are used and the water contains a trace amount of fertilizer. There are shade baskets as well, these were introduced later in the 1990s because the Boulevard trees had grown larger and cast more shade. A mixture of six different varieties of plants are used to make these baskets with a total of 28 plants in each. The people of Victoria are so proud of their baskets some have extended this practice to window boxes and hanging baskets at their homes. 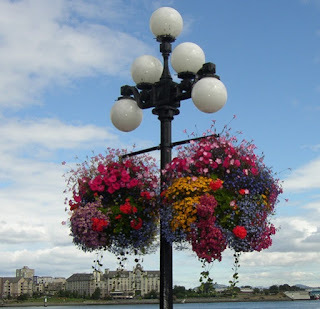 Further reading and a practical guide to creating hanging baskets visit this post from North Coast Gardening - Genevieve Schmidt is a landscape designer and owns a landscaping maintenance company in Arcta, CA, USA. In her post there are stacks and stacks of links to creating all sorts of baskets, a very good read even if you're not planning on making any!